After the Gin Cocktail, we continue the run of classic gin cocktails with the Gin Fix. You’ll see that this and the Gin Fizz which follows are quite similar, but there are some subtle distinctions. The main difference I can discern between a fix and a fizz is that the fix uses regular water instead of soda water, and there is fresh fruit on it. The fruit is apparently the truly defining thing about a fix. I said subtle, right? I did a bit of poking around about the Gin Fix, and one tip that I took away from Savoy Stomp is to muddle a lemon rind to get an extra lemony boost. 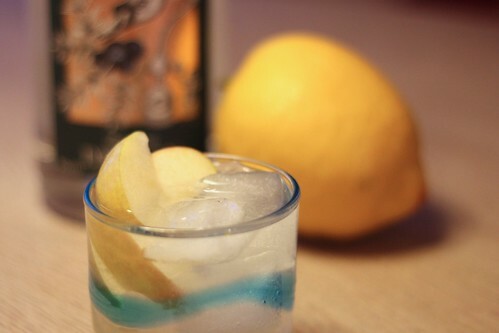 Whether you add a lemon rind or not, you need to muddle that sugar with the water and/or lemon juice at the start to get the sugar to dissolve before you add your gin. Another bit of information you’ll dig up when looking at the Gin Fix is the use of genever instead of gin. This is because genever was the liquor available back in the 1800s when the drink first came into being. That original recipe also called for raspberry syrup. I made mine with gin because by the 1930s gin would have been in wide use (and well, I’m also out of genever at the moment). That said, I love genever and I’m sure it’s great with that as well. Café Royal mentions fill two-thirds full with ice and tablespoon of sugar, instead of a teaspoon. For the fresh fruit I had apples, even though that isn’t really “of the season.” Roll with what you have. What can I say other than this is a nice, refreshing drink. It’s essentially a gin lemonade with fruit in it. Yummy and perfect for summer and the bounty of fresh fruits that brings.